AUGUSTA, Maine — An independent lawmaker from Friendship says he thinks Maine’s attorney general should investigate whether Gov. Paul LePage and a group of radical activists discussed violence against top Democratic lawmakers during a series of meetings last year. As revealed by liberal blogger and activist Mike Tipping, the Constitutional Coalition met with LePage eight times in 2013, and the group has been linked with the Sovereign Citizens, which is described as a terrorist movement by both the federal government and the Maine Department of Public Safety. “If they were discussing killing people in that meeting, then we have a serious problem in this state. That has to be investigated,” he said. When asked Wednesday about Evangelos’ request, a spokeswoman for Attorney General Janet Mills, a Democrat, said only that “there is no investigation.” She would not clarify whether an investigation was pending, but Evangelos said he was told the attorney general’s office was “looking into” his request. One member of the group, Jack McCarthy, said during a radio show last February that the group had discussed charges of treason against House Speaker Mark Eves and Senate President Justin Alfond, both Democrats. McCarthy said that the punishment for treason had never changed. McCarthy, who espoused many other conspiracy theories on his radio show — including one that a coming “holocaust” against U.S. Christians was imminent — seems to be the most radical of the coalition members. Paul Merletti and Wayne Leach, two other members of the group, reiterated Wednesday that they did not recall the subject of hanging or any other form of violence during the meeting. 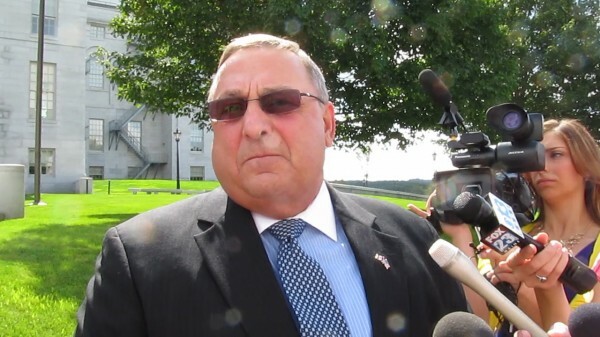 LePage also has denied that the conversation ever turned toward violence. Efforts to reach McCarthy have been unsuccessful. Evangelos said his chief concern is that if any indication was made that the group was contemplating violence, LePage had an obligation to inform law enforcement. Among the many documents the group sent the governor ahead of its meetings was a list of “discussion points.” The first issue was the group’s concern that access to the governor had been too difficult to come by. The group also discussed its concern over the listing of Sovereign Citizens as a terrorist organization, McCarthy said. Documents obtained by the Freedom of Access Act show the group also planned to speak with the governor about its “remonstrance,” a document it claims shows the government is illegal. Despite the violent statements by McCarthy, the group’s remonstrance makes reference to only “peaceful, but strong actions” to restore what the coalition views as a correct government. Adrienne Bennett, LePage’s spokeswoman, said Wednesday that it’s “difficult to take requests like [Evangelos’] seriously. Bennett also said that members of the Executive Protection Unit — a group of Maine State Police officers charged with protecting the governor — were present for LePage’s meetings with the Constitutional Coalition.